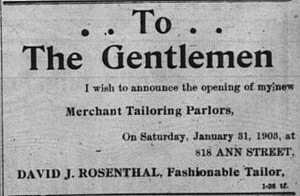 1/8/1903: Morris Frankel‘s political ad, with his three competitors’ directly below his. 1/9: The town Republicans held a meeting the previous evening to put forth their slate of candidates. As expected from developments in late 1902, Morris Frankel was listed as one of four candidates for the Second Ward council seat. 1/14: In an article reviewing the competitive Republican primaries “In the second ward, Morris Frankel seems to have the best of the four-cornered fight for council, he having the united support of the Hebrews and some of the best element of the Republican ward workers. D.W. Cush is his closest opponent, while John Span is also developing much strength among the Slavs. Paul Wasilefski is not considered in the race.” Although there weren’t any more mentions of the new Hebrew Political Club in the paper, I’d have to assume they were working to support one of their own, except election day was on Shabbat! 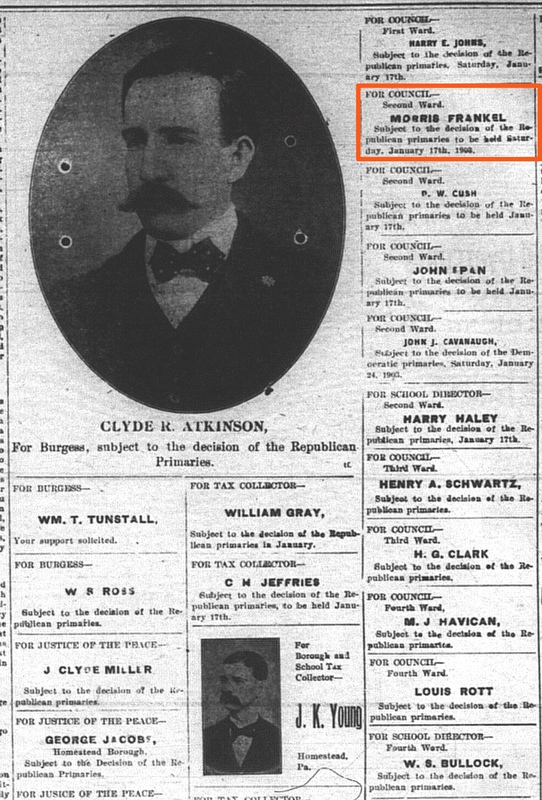 On 1/16 the paper considered all the races too tight to call. On Monday 1/19 — waiting an extra day for the Christian Sabbath to pass — the paper reported: “The Republican primaries Saturday was a record breaker in the matter of surprises…In the Second ward, D.W. Cush won out over Morris Frankel, his nearest opponent by 9 votes.” Though the Republican won all of borough elections on 2/17, they lost control of council, as Cush was one of a number of Republican candidates beaten by a coalition between Democrats and local upstart, the Citizens’ party. This is only Frankel’s first attempt at a political career. Stay tuned for more! 1/27: Though a number of Jewish residents were members of Homestead’s businessmen club and presumably attended the annual banquet, what did they eat when the repast included Blue Point oysters, turkey and beef, chicken croquets, and sliced ham? 2/3: The committee for the high school alumni’s annual midwinter dance on 2/19 included Rose Skirboll. 4/2: Tiger A.C. defeated the Third ave. Stars 13-3, both baseball teams of eleven year-olds. Segelman was the catcher for the winning team. 6/24: The All-Americans won their latest baseball game 12-5. Segelman played shortstop. 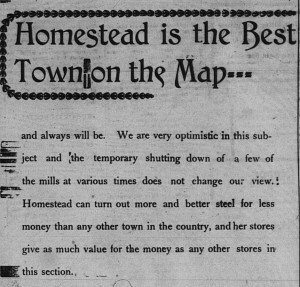 7/14: The Homestead Saving Bank and Trust Co., one of Homestead’s newer banks, printed the list of its recently-elected officers and directors, one of whom was I.S. Grossman! 8/19: The German-American Alliance threw a picnic with donated prizes, two of which came from Jewish stores — a picture from the Half Bros. and a watch fob from Lasdusky. 9/15: A committee appointed to collect money to purchase equipment for the Second ward fire company received donations from Morris Frankel for 10.00 (the highest amount donated), Bernard Hepps for 5.00 (the median amount), and Harry Pollock for 3.00. On 10/7 a longer list mentioned many more: Lewis Beck 5.00, Adolph Hepps 5.00, N. Eskovitz 2.00, Jos. Fried 2.00, M.D. Weis 2.00, I. Samuels 1.00, Mark Fischel 1.00, Morris Fogel 1.00, R. Schermer 1.00, S. Sabel 1.00, Sam Mervis 1.00, I.S. Grossman 1.00, I. Grossman 1.00, A. Marcus 1.00, M. Viess 1.00, Henry Moskowitz 1.00, S. Pruger .25. 9/30: An unnamed Jewish Homesteader was taken for a robber by a deranged man posing as a detective. The strange incident is described at length in the article in the slideshow below. 10/3: Basketball season! The Tigers, with a Segelman son as forward, beat the Little Five 25-4. On 10/10 the paper reported that the Tigers won again, 16-2, over the Little Five. Segelman was still the team’s forward. He made “3 goals from field.” Someone else can explain to me what that means. 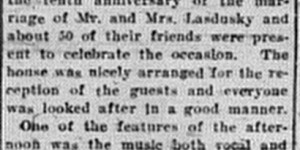 10/13: The committee for a carnival being planned for the end of the month included Lasdusky. 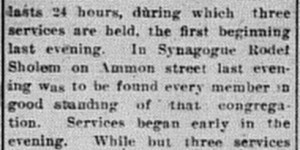 10/14: “Maurice Ruben, the converted Jew, of Pittsburg, last evening conducted a gospel meeting on Eighth avenue.” He was very active in 1902 and clearly continuing his activities, though with less notice by the paper. 11/25: The Tigers defeated the undefeated South Side Midgets 16-3 at the library. Once again Segelman played forward, this time making 4 goals from the field. The Tigers are now the undisputed champions in the 11 and 12 year old class. This suggests that the player we’ve been reading about is Louis Segelman. 11/30: Another Tigers victory, this time 34-6 over the Columbias 34-6. Segelman played right forward and made 5 field goals. 12/8: On the same day Max Markowitz‘s liquor store was robbed (see below), three boys who stole liquor from a wholesale liquor store (and yet the article does not say which liquor store) forced his son, Morris Markowitz, to drink a pint of whiskey, which made him pass out unconscious. Full story in the article slideshow below. 3/5: The paper announced the Second ward school concert, which would include a violin solo by William Skirboll. Over 800 people attended. The review of the concert said that the“scholars made a great big hit…The first number on the program was a violin solo by William Skirboll, which was very fine.” The program also included a pantomime, “Jesus Lover of My Soul.” Ah, public school in 1903. 6/2, 6/3: Rose Skirboll was reelected a teacher in Homestead and assigned to the Fifth ward. Robert Gluck rendered an oration on “The Army of the Discontented,” in which he showed that while it was the content who were happy, that it was the discontented who made a success in life, they never being satisfied with their station in life or their achievements and were always striving for something better. The young man acquitted himself most creditably and was well received…Mannie Haupt dealt with “Wireless Telegraphy” in an oration, telling of this, the latest and most marvelous discovery and what had been done along this line and the possibilities it offered. He handled his subject well, showing he had given it much thought and study. He was the last graduated on the program. A Mean Prank Played by the Class of ’04 on Three of the Graduates. The next day all the recent graduates held a farewell to their teacher. A speech was given by Harry Skirboll, class of 1902. His brother from the class of 1900 was there, as were all the recently-graduated boys. The real estate marked had cooled since the boom around the turn of the century, and thus this section is far shorter than it has been recently. 2/28: Hungarian tenants in one of I.S. Grossman‘s tenements hung their clothes too close to a stove to dry and they caught fire. Fortunately the only damage to the house was to the mantle. 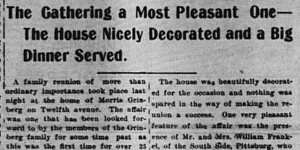 6/8: “Morris Grienburg (sic) has purchased the dwelling of Michael Maloney on Twelfth avenue, in which he has resided for some time” One of these two listings must be mistaken. 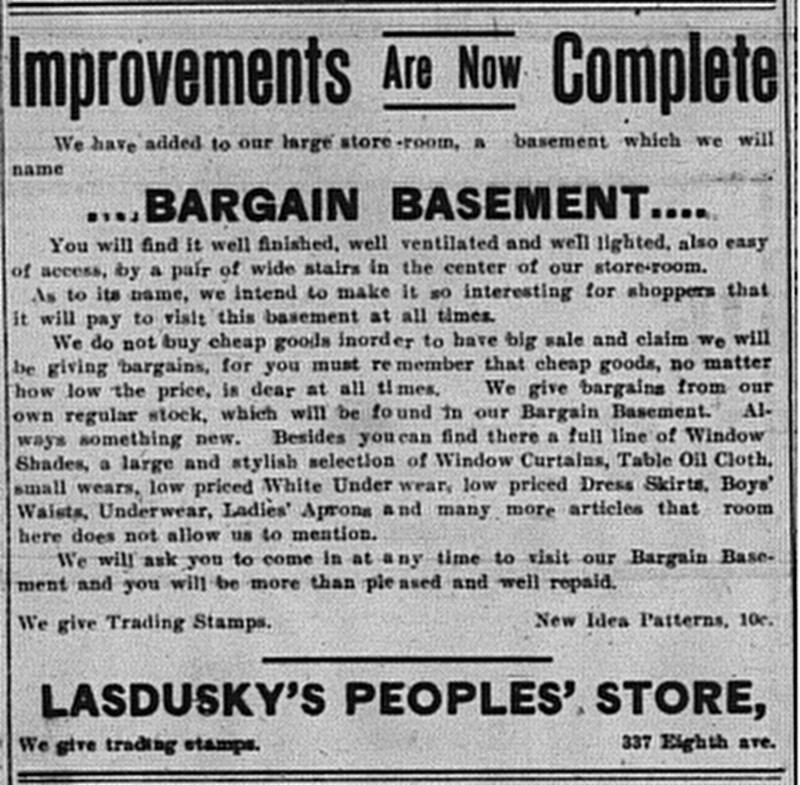 3/12/1903: An ad for Lasdusky‘s new bargain basement. 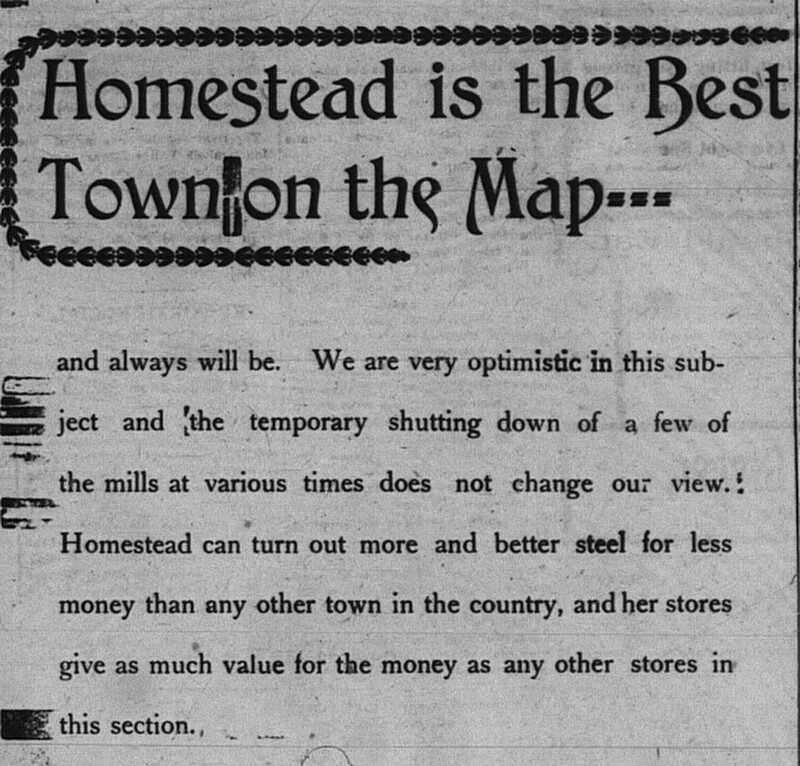 4/10: Grinberg Bros. now “have one of the largest and best equipped stores in Homestead… The success of this firm is due solely to their hustling ability, honest dealing and courteous treatment of their customers.” The rest of the praise is in the slideshow below. 9/25: An article about the millinery opening at Lasdusky‘s store mentioned the beautiful window display. 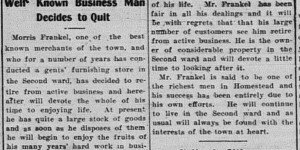 10/7: Morris Frankel, though just 37, “has decided to retire from active business and hereafter will devote the whole of his time to enjoying life…[He] is said to be one of the richest men in Homestead and his success has been entirely due to his own efforts.” Full story below. I’m not at all jealous. No, not at all. 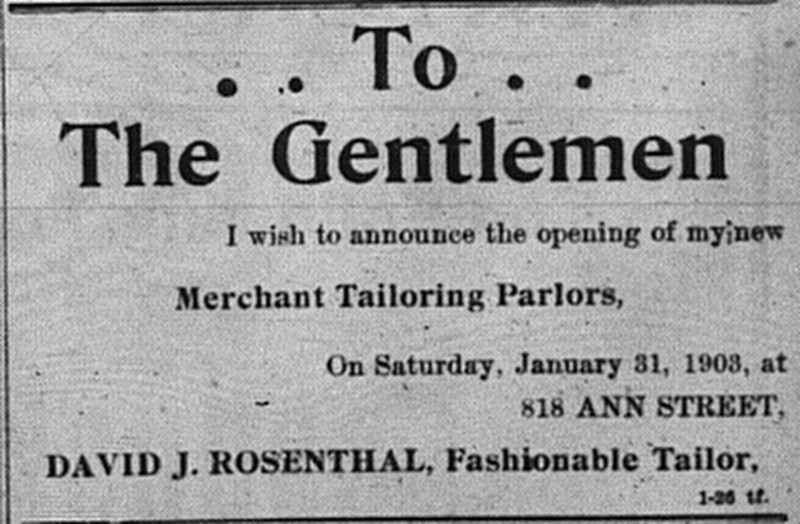 10/23: Benjamin Friedlander‘s store started a big, three-day sale, “having purchased the entire stock of dry goods, gents’ furnishing and millinery of J. Friedlander, 1322 Carson street, Southside, Pittsburg.” He had a brother and a cousin the seller could have been. This was probably his brother, Julius. This kind of buy-out often happened when the other merchant’s business was failing and needed to raise money quickly to cover its debts. The list of retail applicants included just two members of the community — Bernard Hepps, 404 Dickson street, and Reuben Schermer, 448-450 Third Ave (2/21). Hepps had lost his license last year, but regained it by buying one off someone else. Schermer had lost last year as well. The one man who did succeed in getting a license, Moranz, did not apply this year. License court opened 3/16 with 2059 total applicants — 1,593 for retail and 566 for wholesale. The Anti-Saloon League and other filed more than 500 remonstrances — including one against every applicant in West Homestead. 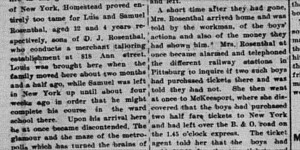 By mid-March, Homestead saloonkeepers were dreading the ordeal of license court, not only because Pittsburgh’s top hotelkeepers had just received rough treatment at the hands of the judges, but also because a detective hired to gather information against saloonkeepers had recently spent a lot of time in Homestead (3/19). Nevertheless, “all the old applicants in the Second ward got off comparatively easy, and few of the new ones met with much encouragement” (3/30). Overall, “the Homestead applicants got through with little trouble…The general opinion of those who attended the hearings is that Homestead will not receive many additional saloons” (3/31). In mid-April the retail results were announced: Hepps was approved, and Schermer was refused (4/14). A total of fifty licenses were granted to Homestead, including 22 in the Second ward, where Hepps’ saloon was (5/1). 3/24: “Herman Schoenfield, the well known clothier of Eighth avenue, has sued O.R. Steele for false pretense.” The man made a $7.50 downpayment on a $20 coat and said he would pay the rest the next day if his wife liked it, or he’d return it for a refund. Instead he skipped town — and stayed away so long that his wife also sued him for desertion and non-support. 7/20: The previous day, Max Mervis‘ barber shop was robbed of 3,500 cigars and cigarettes worth over $100, as well as a safety razor. The robbers also broke a $25 violin. They broke into the back of the store and were screened by a curtain from the front of the store. Four boys ranging in age from 9-14 were caught the next day, and they confessed to the crime. Two of the boys even admitted they had been stealing from the fruit stores in Homestead for years, and seemed proud that people knew what they had done. 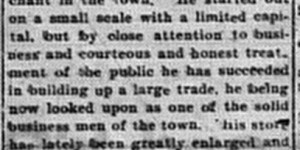 8/18: A fourteen year-old boy was charged by Pauline Fishel of stealing a watch and three revolvers from her jewelry store while she was in the back room. 10/2: The day after Yom Kippur Lasdusky‘s store was robbed, along with another clothier’s. Full article below. 11/18: A man who was employed as shoe polisher at Wolk‘s shoe store was found guilty of stealing shoes to give them to a lady friend in Braddock. 12/8: The previous evening the wholesale liquor store of Moskowitz & Markowitz, at 206 Sixth avenue, was burglarized. The front window was smashed and the most expensive liquor in the store was stolen. It seems quite likely that these robbers were the ones who forced Morris Markowitz to drink until he passed out. 12/14: My great-grandfather Bernhard Hepps‘ hotel was burglarized early Saturday morning. A watch and clothes were stolen. 12/15: The almost-completed Frankel building at 503 Fifth avenue was badly damaged by a gas explosion. Full article below. 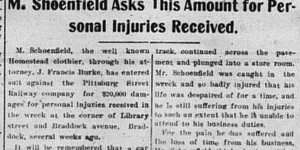 1/26: “Max Schoenfield, the well known clothier, of this place, was seriously injured in a rear-end collision of two cars on the Monongahela division of the Pittsburg Street Railway in Braddock at 11 o’clock last night, in which both cars were badly damaged and three others were more or less injured.” He was “in the front of the car,” “received a hard blow on the head which rendered him unconscious,” and is now “suffering from concussion of the brain and hurt internally.” On 2/23 the paper wrote that he “entered suit against the Pittsburg Street Railways company for $20,000 damages for personal injuries received.” This article explains that he was “so badly injured that his life was despaired of for a time, and he is still suffering from his injuries to such an extent that he is unable to attend to his business duties.” The paper, alas, did not print the result of his case. Both articles are reprinted below. 1/31: “Samuel Segelman, aged 16 years and 7 months, died last evening at his home, 231 Eighth avenue after a long illness with dropsy. He was the son of Mrs. C. Segelman, the jeweler, and was quite popular with a large circle of friends. The funeral will be held tomorrow morning at 9 o’clock from the residence of the boy’s mother. The interment will be made in the Jewish cemetery at Homeville.” It is especially tragic to consider that Mrs. Segelman was widowed in 1894 and raised her six children on her own. 3/24: Louis and Samuel Rosenthal, teenaged sons of David J. Rosenthal, ran away from home. Having moved to Homestead recently from New York City, they were “discontented. The glamour and the maze of the metropolis which has turned the brains of many older people was not to be found here and this was the one great annoyance of Samuels life.” The boys were intercepted in the train station in Washington, D.C. Full article below. 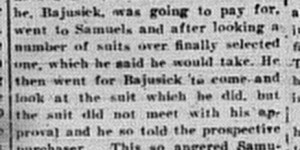 4/2: A man sued S. Samuels because, when he told his friend not to buy a suit from Samuels, Samuels “grabbed [him] and taking him to the door, strick (sic) him, knocking him out in the the street, and then, it is said, he followed him out and struck him again.” All the sorry details in the slideshow below. 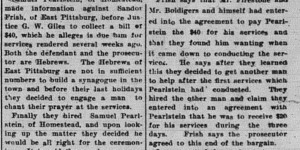 10/16: The following is probably my favorite newspaper article so far: For the High Holidays the Jews of East Pittsburgh, who were too few in number to have their own synagogue, hired Samuel Pearlstein, a member of the Homestead community, to lead services for them. They did not feel he did a good job, so they found a second man to take his place. 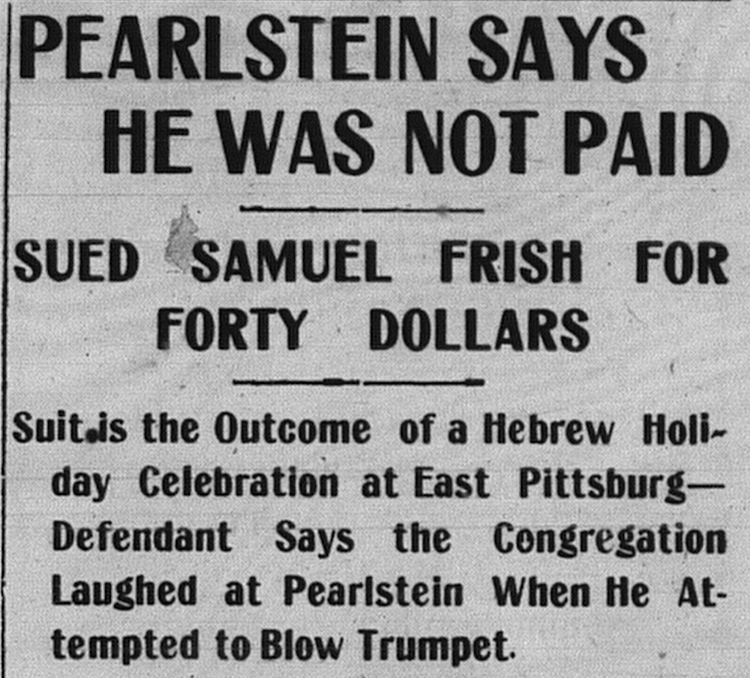 How this did or did not alter the original agreement with Pearlstein turned into a lawsuit. The full article is in the slideshow below, but the headlines at right are just… phenomenal. 11/25: M. Marks’ aged mother died in Obenfield, Germany. He had visited her a year ago after an absence of 16 years. 12/5: The daughters of Mr. and Mrs. B. Friedlander were bitten by rats while they were sleeping. The full article with all the disgusting details is in the slideshow below, if you can bear it. 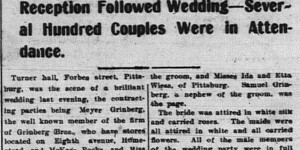 9/11: The previous evening Meyer Grinberg of Grinberg Bros., “who have store located on Eighth avenue, Homestead, and McKees Rocks” married Tillie M. Broudy of Oakland, in Turner Hall on Forbes St. in Pittsburgh. The article, linked below, describes the ceremony and names the many members of the wedding party. 10/28: Harry Glick, a Homestead resident working as a salesman in a Pittsburgh clothing store, and Ida Weinfield, a niece of Mr. and Mrs. Morris Frankel, were married in the Homestead synagogue, after which 200 guests dined and danced at the Frankel house. 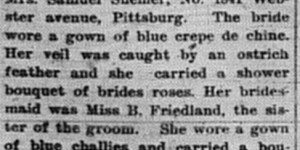 10/28: Miss Ida Kamins (formerly Kaminsky) married William Friedland, of McKeesport. See below for the full article. 12/1: My great-grandfather’s brother Alexander Hepps married Celia Klein, daughter of Mr. and Mrs. Klein, in the Homestead shul. The reception was held at her parents’ house at 313 Dickson. 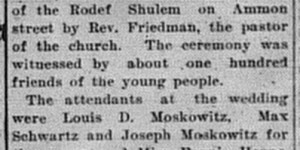 Attendants included Louis D. Moskowitz, Max Schwartz, Joseph Moskowitz, Fannie Hepps, Rose Klein, and Esther Moskowitz. Sponsors were Bernhard Hepps and Henry Moskowitz. Morris Markowitz was master of ceremonies. Full article below includes the strange color of dress the bridesmaids wore. 7/13: “Robert Glueck, of Eighth avenue, left last night for a three weeks’ vacation at Mt. Clemens, Mich.” He graduated from high school at the end of June. 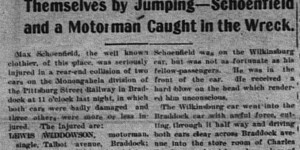 9/1: “Israel Rosenbloom, of Braddock, was circulating among friends yesterday afternoon.” He was a Homestead resident until some time in 1901. 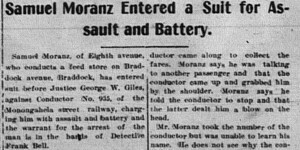 2/6/1903: Moranz sued a streetcar conductor for assault and battery. 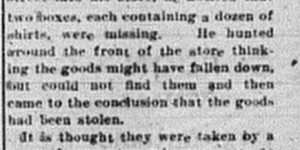 2/14/1903: Shirts were stolen from I.S. Grossman‘s street display. 2/23/1903: The Lasduskys celebrated their 10th wedding anniversary. 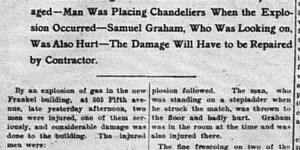 4/2/1903: S. Samuels was accused of attacking a prospective customer’s friend. 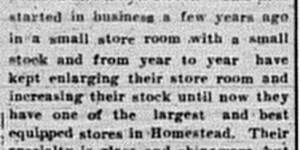 4/10/1903: Lots of praise for the Grinberg Bros’ store. 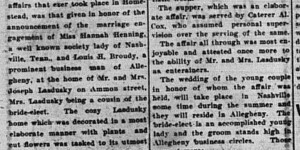 5/4/1903: A big engagement party for Mrs. Lasdusky‘s cousin from Nashville. 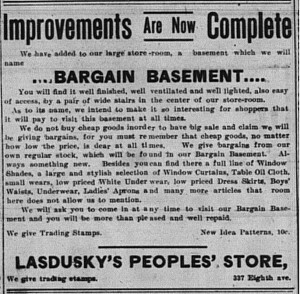 6/19/1903: Lasdusky turned over his retail dry goods and millinery business to his wife. 6/26/1903: The junior class at the high school played a mean prank on three Jewish members of the senior class. 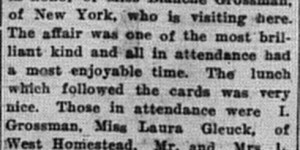 8/24/1903: A whist party in honor of Blanche Grossman, visiting from NYC. 9/2/1903: A summary of Charles Frankel’s Bar Mitzvah — and his speech! 9/11/1903: The wedding of Meyer Grinberg! 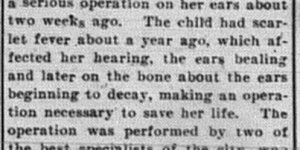 9/17/1903: Matila Cohn was operated on to restore her hearing and save her life. 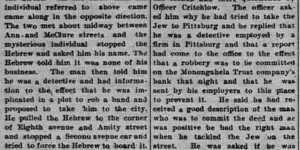 9/30/1903: An unnamed Jewish Homesteader was taken for a robber by a deranged man posing as a detective. 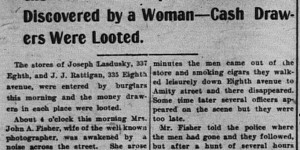 10/2/1903: Robbery of Lasdusky’s store. 10/7/1903: Morris Frankel is retiring?! 12/1/1903: Wedding of Alex Hepps and Celia Klein. 12/5/1903: B. Friedlander’s daughters were bitten by rats in their sleep?! Uch. 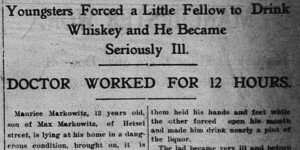 12/8/1903: Morris Markowitz was forced to drink until he passed out by the boys who probably robbed his father’s liquor store. 12/15/1903: An explosion badly damaged Morris Frankel’s new building. The Jewish holidays were not covered as much as in past years. Passover wasn’t mentioned at all. The success they had in paying off their mortgage is noted below and covered in a separate post. Twenty Five Composed the Charter List. Trustees–Joseph Lasdusky and Morris Frankel. 2/14: The Hebrew club will meet Sunday afternoon at 3 o’clock in the basement of the synagogue, Ammon street. All members are requested to attend.” This is the Sunday before Tuesday’s election day. 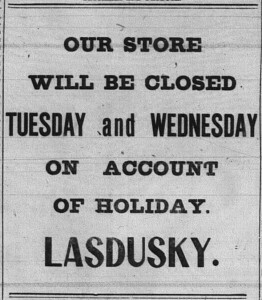 9/21/1903: Advertisement regarding Lasdusky’s store on Rosh Hashana. 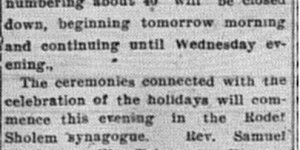 9/21: The newspaper alerted its readers that the next day is Rosh Hashana and the the 40 Jewish stores in town would be closed. 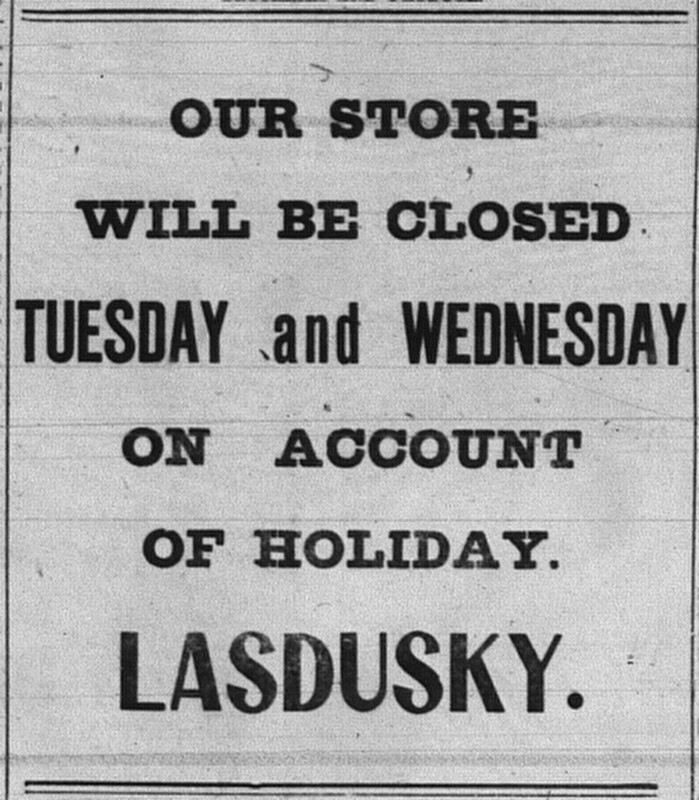 Advertisements showed that the Reform Half Bros. closed their store for one day, while the traditional Lasdusky closed his for two. 9/30, 10/1: A couple articles, one published on erev Yom Kippur and the other on the day of Yom Kippur, explained the holiday to readers. 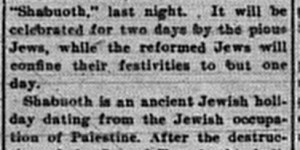 9/21/1903: Tomorrow is Rosh Hashana. 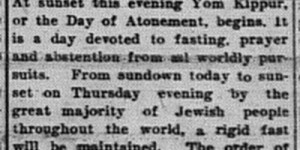 9/30/1903: Tonight begins Yom Kippur. 10/1/1903: Today is Yom Kippur. 1/2: “Silvira Ida Gordon (Silvia Ada Gordon? ), a young woman, entered suit in Common Please No. 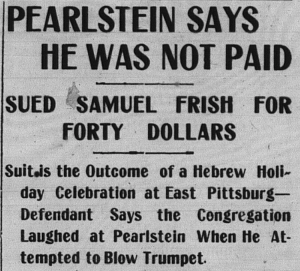 3 against Adolph Rosen, a musician instructor of Pittsburg, for damages for alleged breach of promise of marriage…The plaintiff claims that the defendant promised to marry her at Chicago four years ago. At the time, it is said, the plaintiff was sewing for a living while Rosen was endeavoring to obtain a musical education. All these four years, the young woman says, she has worked as a seamstress constantly, and to assist the defendant she gave him what she could spare of her earning.” Surprise — he refused to marry her after graduating. Although not a Homesteader, Rosen was well-known for playing concerts in town. He’d play the synagogue ball the following month! I can’t find in the papers how the case turned out. 4/6: “A mass meeting was held yesterday afternoon in the Synagogue of Agudat Achim, Talbot avenue, Braddock, in the interest of the Universal Israelite alliance. A large audience was present. The alliance has for its prime object the education and general assistance of the poor and ignorant Jew, and looks especially to helping newly arrived, friendless Jewish immigrants.” An earlier article mentioned that Dr. J. Leonard Levy of Rodef Shalom and Hon. Josiah Cohen, two of the leading Jews in Pittsburgh, as well as L.B. Michaelson from NYC would be speaking. 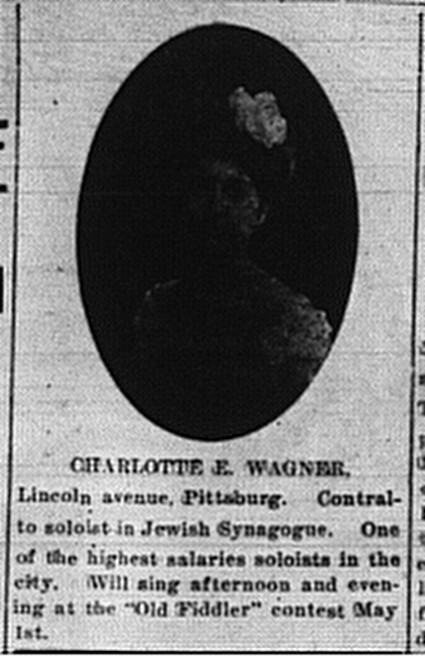 4/23: The “Old Fiddlers” contest taking place in Carnegie Music Hall in Pittsburgh, featuring musicians from all over Western PA, included a female soloist from a synagogue! See image at right. 6/10: The Homestead paper published a very long article about the (first) Kishineff Massacre, which took place April 19-20, 1903. 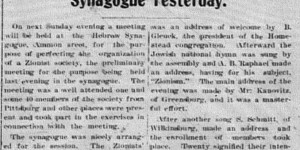 9/1: It also published an article about the sixth Zionist conference, which took place at the end of August 1903. This congress was the one during which Herzl proposed his famous Uganda program. 10/3: And the paper published a long article considering it! 9/2: Maurice Goldman was arrested for throwing bottles on the street. 2/20/1903: A Poetical Glance Of…Samuel Cohen! 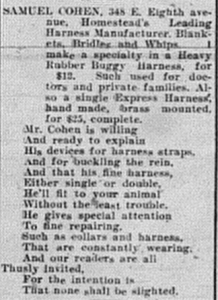 Not an advertisement, but on 2/20 the paper published, “A Poetical Glance Of the Prominent Business Houses in Homestead,” including “Samuel Cohen, 348 E. Eighth avenue, Homestead’s Leading Harness Manufacturer. Blankets, Bridles, and Whips. I make a speciality in a Heavy Rubber Buggy Harness, for $12. Such used for doctors and private families. 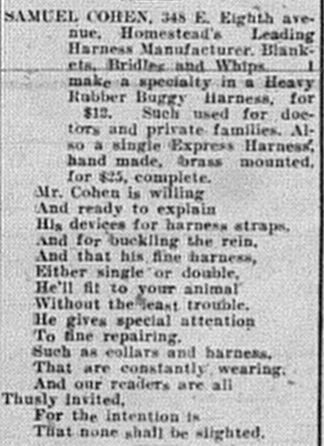 Also a single Express Harness, hand made, brass mounted, for $25, complete.” That is not the poem, though! The poem is at right!